For those not familiar with the music of Gong, they might possibly be described as a kind of jazzy existential cosmic rock band. To some extent their style and outlook might be compared with Hawkwind, but the material is rather more strange, complex and steeped in a mythology that involves a continuing story (over several albums) about a search for enlightenment. If you think that this all sounds a bit too serious, then think again. There’s a lot of humour in their songs. And, as tonight proves, Gong’s music (and their performance) is incredibly enjoyable and terrific fun. The support band tonight is The Roz Bruce Infusion. Lead-lady, Roz, is a formidable musician, playing her guitar like a female Hendrix (including briefly playing the instrument with her teeth), and yelping like Siouxsie (of the Banchees) at times. The rest of the band are darned good musicians too. The style is guitar-mangling alternative / psychedelic rock. Lyrically, she’s a bit of social commentator, for example, with songs dealing with socially difficult situations and alcohol problems. The frantic final song, “Wicked While”, is particularly impressive. The band has an album coming out soon. 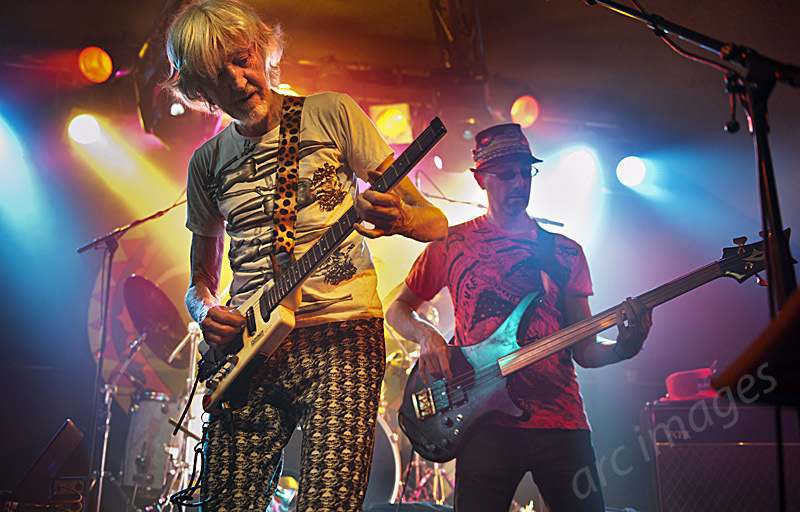 A huge number of musicians have passed through Gong’s ranks since the group was formed by Australian, Daevid Allen (ex-Soft Machine), in 1967. 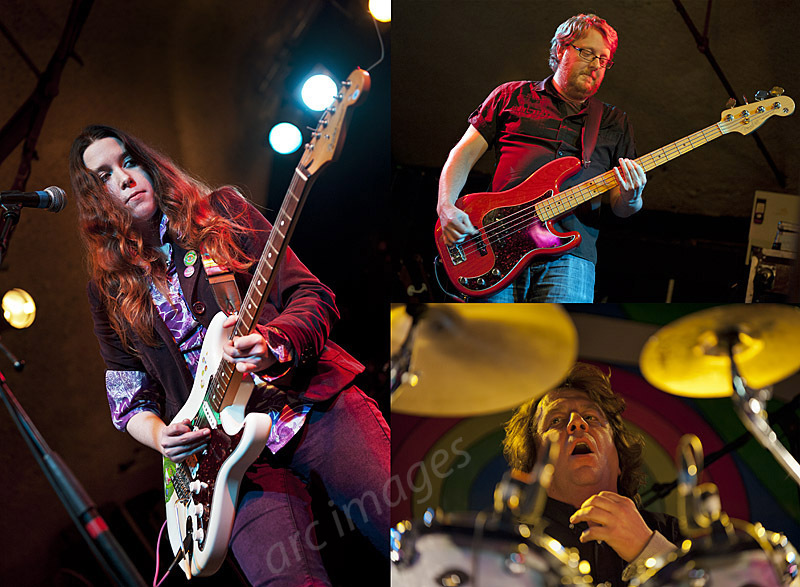 There have been many offshoot bands and reformed versions over the years too. In the current band only Allen and singer Gilli Smyth remain of the original line-up. Sadly, Allen explains, Gilli cannot be here tonight, so we miss out on her uniquely strange cat-like vocals. Allen suggests the audience make a loud ‘meow’ for her, which they willingly do. He assures us she will definitely hear it (wherever she is). 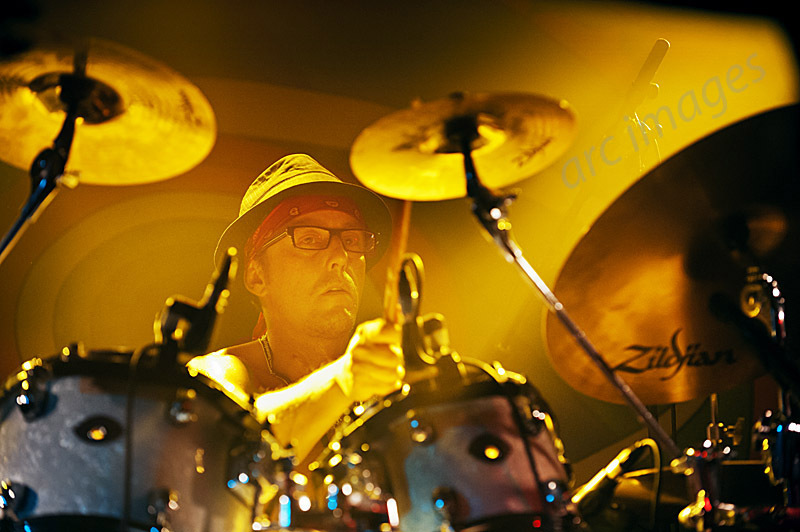 However, keeping things in the family, Allen’s son Orlando, has now been drafted into the band on drums. I won’t bang on about the Gong heritage anymore – you can look them up on Google if you want to know. 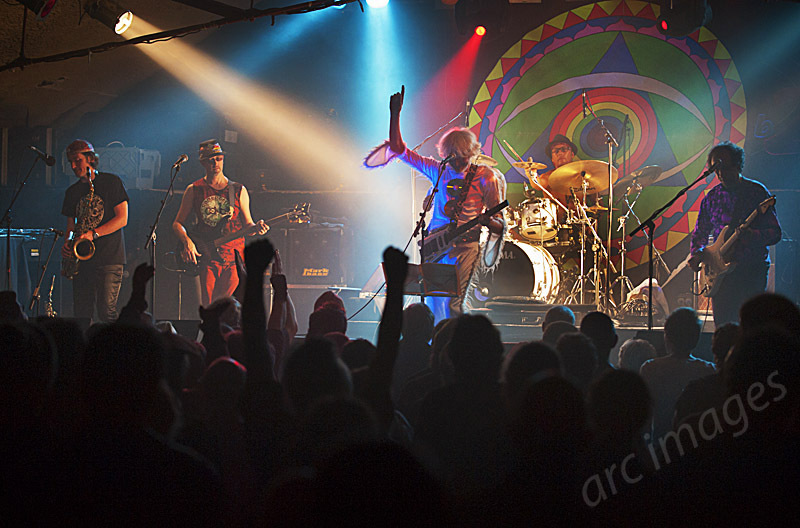 Also Gig Junkies has reviewed Gong before, in 2010, so some info is there too! The gig begins, to the amusement of the audience, with the band huddling together on stage, while making a communal ‘om’ sound. 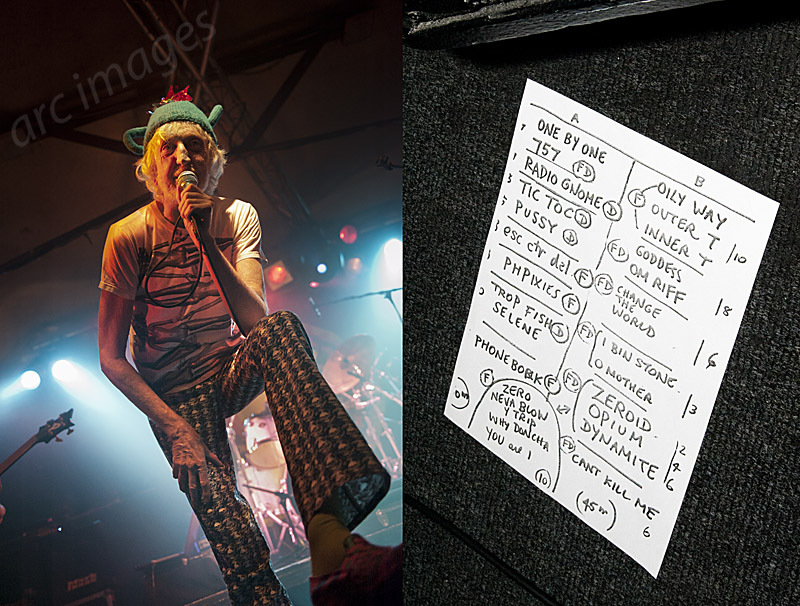 Unsurprisingly, as founder member, Daevid Allen is the focal point of the band live. Despite his age, he is incredibly thin and fit, dancing around the stage like a teenager. Most of the time he is playing a compact, box-shaped, Hohner guitar, including torturing its strings with the removed whammy bar. At other times, unencumbered by his guitar he stalks the stage and sings with extravagant gestures, seeking response from the audience. 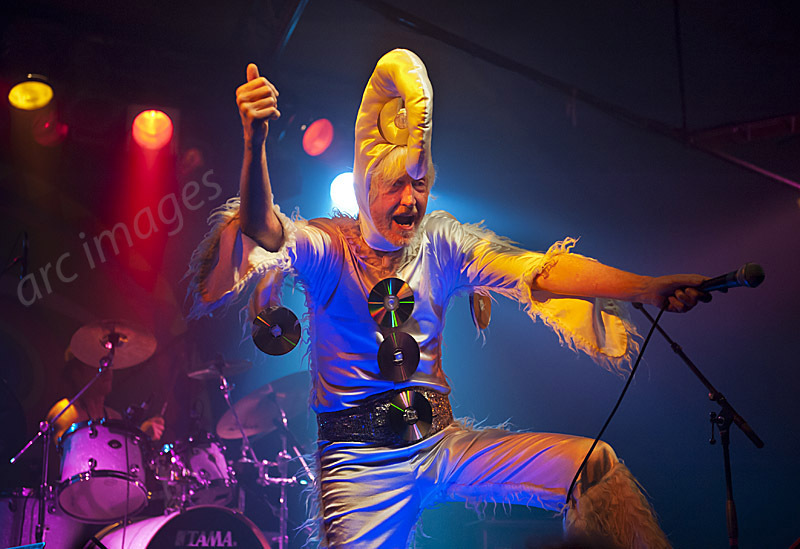 Daevid Allen is well known for his stage costumes and tonight does not disappoint. 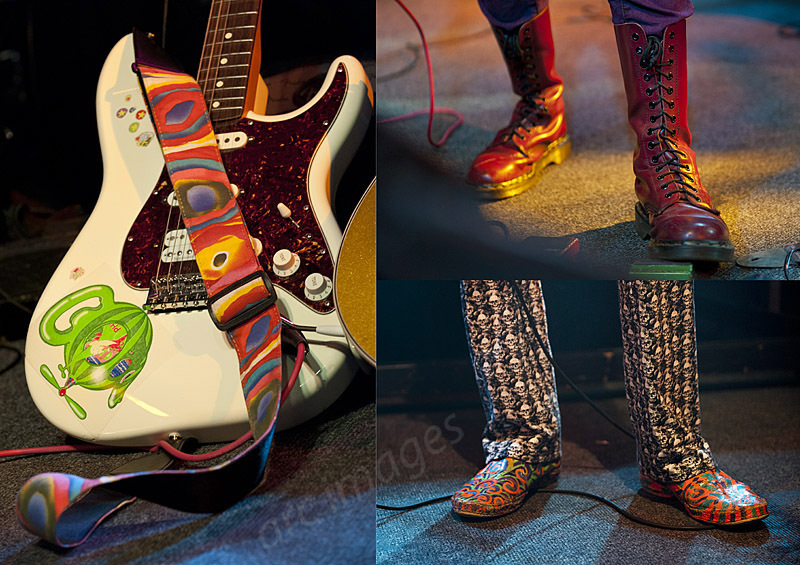 Initially he comes on in drainpipe trousers with multi-skull patterns, a red hat and multicoloured shoes. Later we get a sort of wizard outfit and finally his famous (what I can only describe as) sequined Elvis-jester tasselled jump suit, replenished with attached CDs. Gong’s set finishes around 10.30pm, with Allen announcing they will be back on stage soon. However, time passes by and no band. We guess they will be back, as the lights stay down and the equipment remains buzzing. Eventually, after about 15 minutes they are back, and far from being an encore, we get what amounts to a second set, with it only ending shortly before midnight. You get the impression that the band would like to play all night. 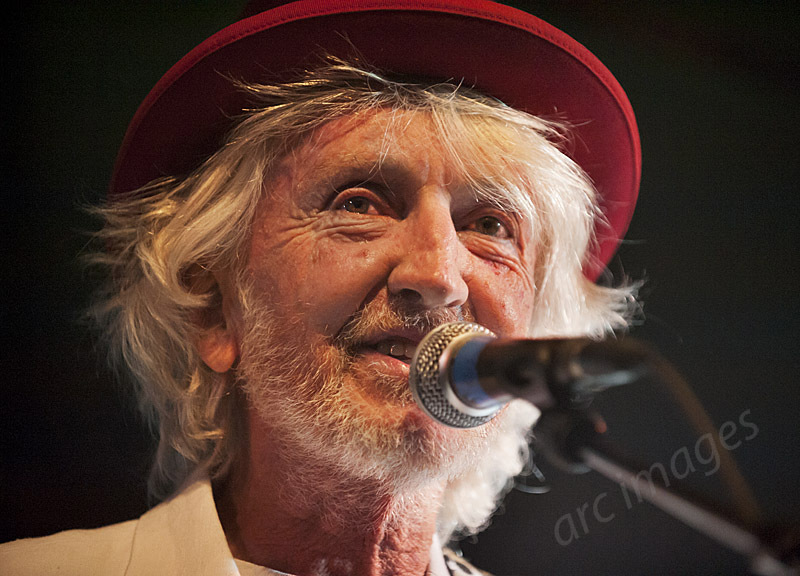 For a man of 74, Daevid Allen still has plenty of stamina and enthusiasm for making good music. 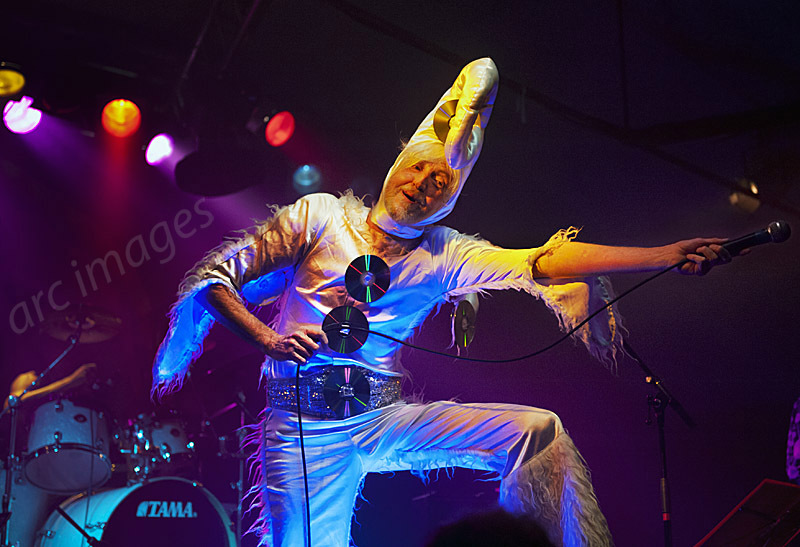 The lengthy sets tonight draw from Gong’s extensive repertoire, with a good dip into their best known early albums, including the brilliantly named “Camembert Electrique”. We get classic tracks, including “Radio Gnome Invisible”, “Pot Head Pixies” (“we are crazy”, “the green planet gong is my home”), “I Bin Stone Before” and the sing-along and chatty (featuring French conversation) “Oily Way”. Introducing a track he wrote in 1969, “Glad to Sad to Say”, with its lyrics about changing the world, Allen says the world now needs changing more than ever. The audience agree. 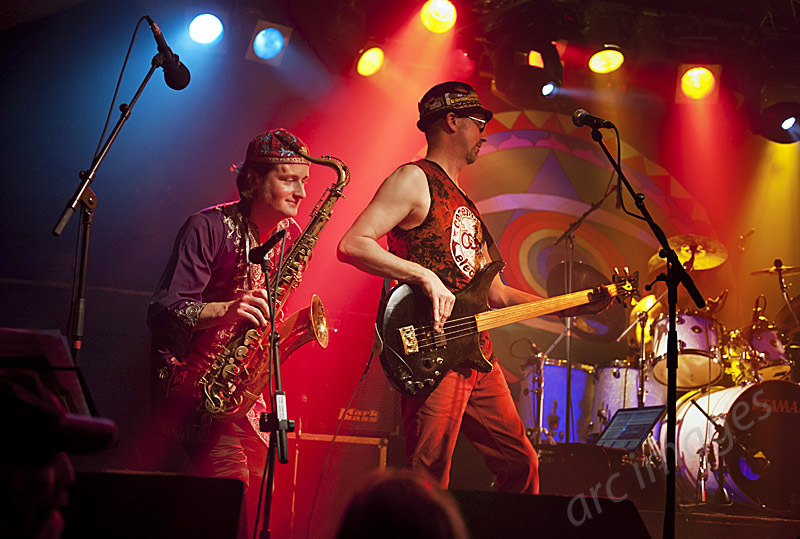 Gong’s material is very varied in style, at all times experimental, sometimes jazzy (the line up features saxophone and flute player Ian East), sometimes very hippy and alternative, but some numbers are basically punk rock. It’s very much a ‘performance’ requiring an audience reaction, rather than just reproducing the songs. The lyrics and the performance contain a considerable amount of humour and I particularly enjoyed the count-in to one song, ‘alpha, beta, gamma’. Also tea is mentioned a lot in their songs, which can’t be bad. Altogether a strange, but entrancing evening, and an opportunity to see a unique and legendary band.